Not many places in the world provide the whole cycling package like Whistler does. There’s the industry-leading Whistler Mountain Bike Park which provides over 200 kilometers (124 miles) of coastal mountain single-track, lots of mellow cruiser trails for the kids around town, road cycling at altitude, another 200 kilometers (124 miles) of valley singletrack and tons of jumps, bumps, drops and rolls to get the stoke meter high. 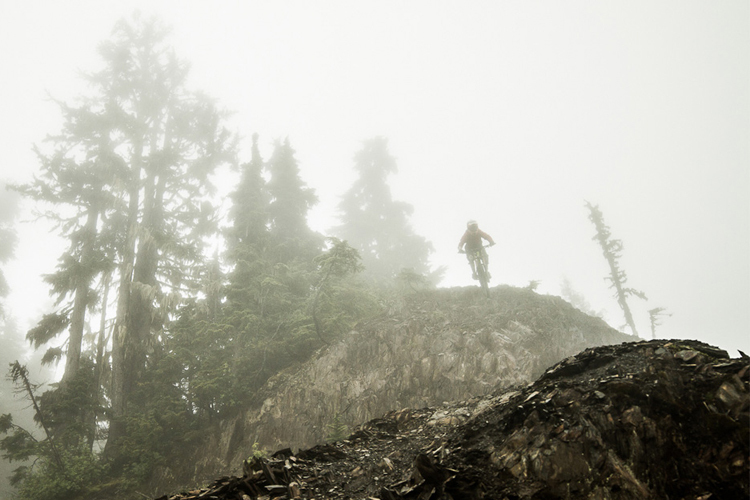 The real dilemma is deciding what bike and what gear to choose for your Whistler vacation. But when I say “one bike, one place” do not assume I am talking about that one all-mountain or cross-country bike that you can try to ride every style on. 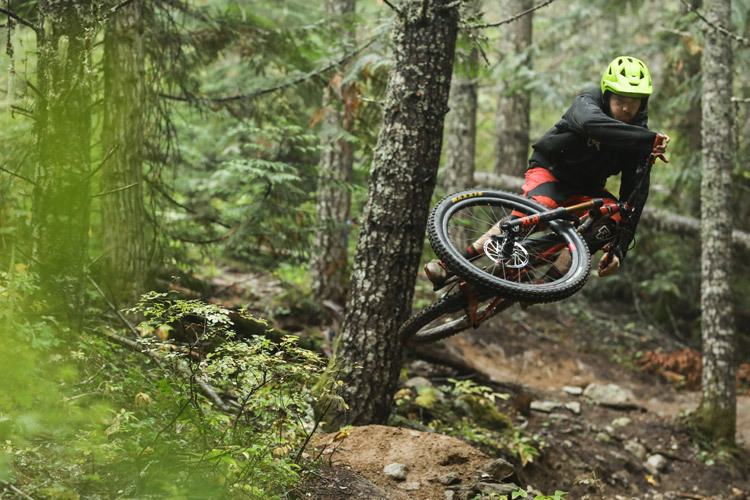 The point of “one bike” is that you can just bring one bike to Whistler— whichever one you want— and you will still have the best two-wheeled fun of the summer. It shouldn’t be a fight between your downhill bike and a much-loved family member for that one extra spot in the car. Just pick a bike, any bike. One of Whistler’s greatest unsung heroes is the Valley Trail, a 40-kilometre (25 mile) path of buttery smooth pavement that will get you all the way from Emerald Estates at the north end of town to Function Junction in the south (but the real fun is exploring everything in between). The Valley Trail will keep you safely off Highway 99 (leave that for the road cyclists) and take you past many great viewpoints and beautiful spots by the lakes and rivers all around Whistler. 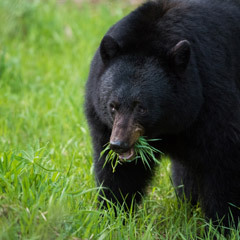 The trail is multi-user so plan on passing other cyclists, roller skaters,dog walkers, skateboarders, baby strollers and sometimes even bears (they are mellow and usually just walk away). With minimal hills to pedal up the Valley Trail is a beautiful and safe way to travel around Whistler while taking in some of the incredible sights this place has to offer. 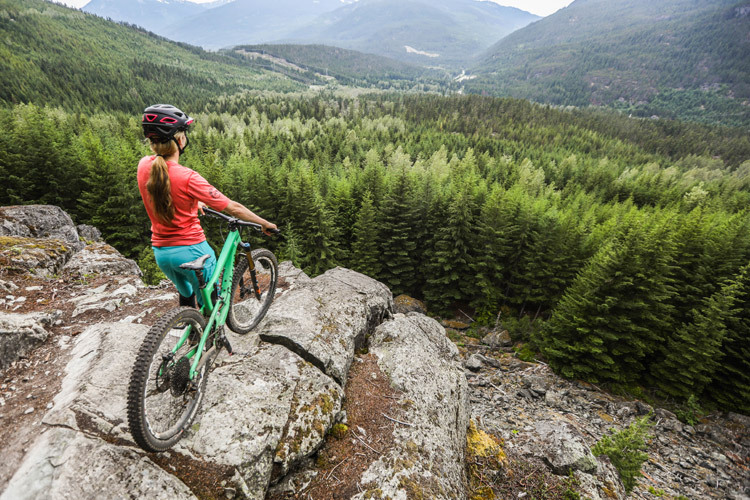 There are an extraordinary amount of single-track cycling trails here in the Whistler Valley. You can look in any direction at the mountains and it’s a fair guess that under that rainforest canopy a spider web of trails and hidden gems await. With 200 kilometers (124 miles) of legal, maintained trail you’ll be blown away regardless of your riding style or skill level. Many trails are maintained by a local organization called WORCA so grab a trail map from a local bike shop (proceeds support trail maintenance. Even better, buy a WORCA pass to really support Whistler trail building and maintenance). Ask the folks at the bike shop for some tips about picking a route before heading out. Depending on what floats your boat, the pump track and dirt jumps can make for a good warm up before heading in to the Whistler Bike Park. Lots of local man-hours have been put in to making these areas fun for everyone. Located next to the Whistler Skate Park and Fitzsimmons Creek, riding the dirt jumps is a fun, relaxing scene with a range of jumps for all levels. Anyone is welcome and it’s definitely worth checking out. The pump track is very low consequence, a lot of fun and a really good spot to get back in riding mode if you have been off the bike for a while. The track is located just a few kilometres outside of Whistler Village beside the Valley Trail in Alta Vista (near Lakeside Park). 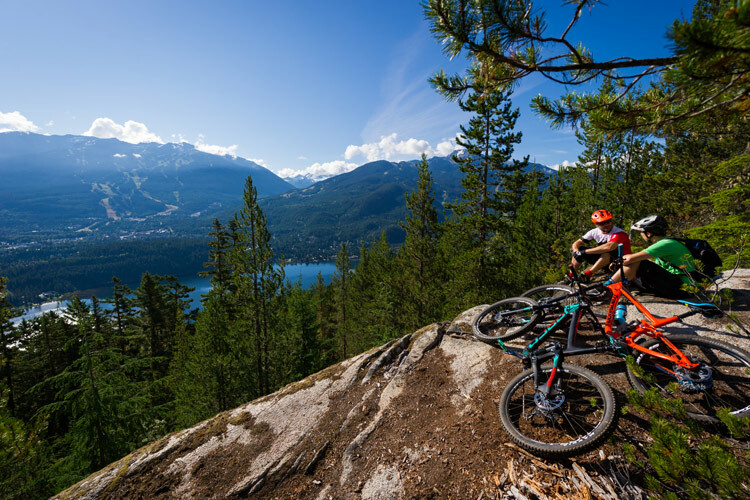 If you’ve made it to Whistler with your big bike it would be rude not to ride the famous Whistler Bike Park. People travel from all over the world to ride this place and for very good reason— you name it the bike park has it! With over 900 vertical metres (3000 vertical feet) of rideable terrain, the park really does have something for every skill level. 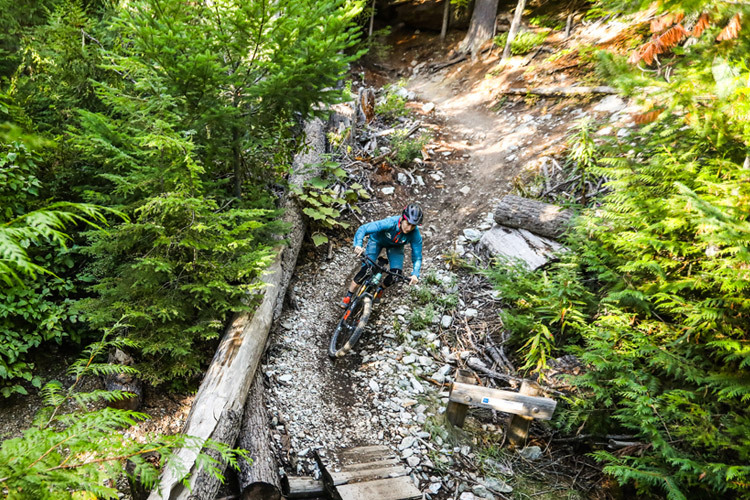 A definite must-ride is the Top of the World Trail off Whistler Peak which extends lift-accessed riding into the alpine for a once-in-a-lifetime descent of over 5000 vertical feet (1500 metres) back down to the Village. All the bike park terrain is accessible via a chairlift and gondola so no energy is wasted pedaling up before hitting the trails. If you need someone to show you around on the mountain, there are a number of guides that can take groups of riders out and help with skills as well as show you the best spots to ride. (And if you didn’t bring the big bike, don’t worry, Whistler has lots of shops around town that provide high quality mountain bike rentals). Whistler has a very strong and friendly cycling community. With so many trails and bike options it’s never a problem meeting new people, finding new spots and having the best summer bike vacation ever. Regardless of what bike you bring you will itching to get back and ride again. Pick a bike, any bike… and I’ll see you on the trails. Ollie is a very civilized Englishman who’s been living in Whistler for the past four years riding bikes and snowboarding as much as possible. In his spare time he shoots photos and video. Ollie basically lives the dream and all the photos used in this post are his. Check out this video of Ollie practicing what he preaches then take his advice, choose your favourite bike and get up here.